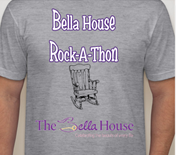 The 2nd Annual Rock-A-Thon has rocked into history raising over $4000 for the Bella House. However, it is not too late to get this incredible T-Shirt that will identify you as an official Bella House Rocker. Hit the button to order yours now!! !